I’ve always wanted to go to Alaska. It ranks up there with Ireland, Maine, Switzerland…you get the idea. I am smitten with vast wilderness, mountains and fields of green and rock. 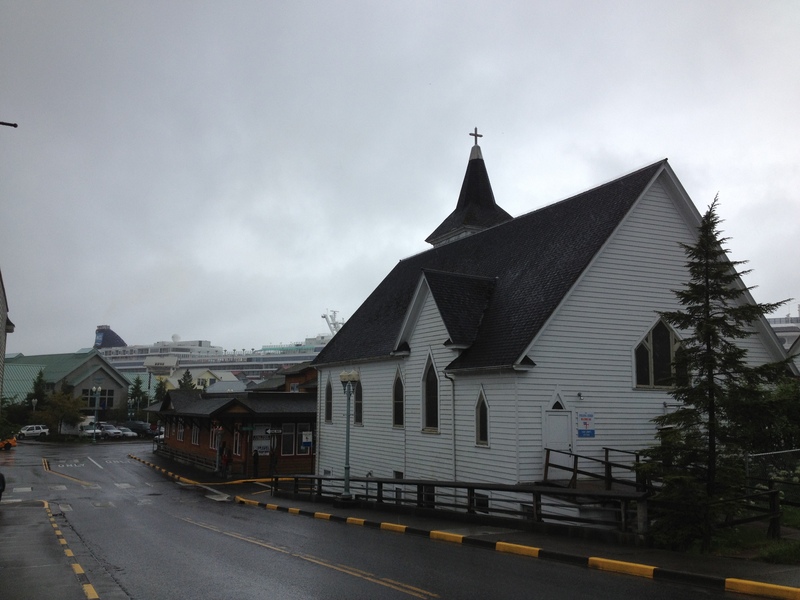 Our first stop on the cruise, after one day “at sea” was the town of Ketchikan. Our ship docked and we disembarked to explore. 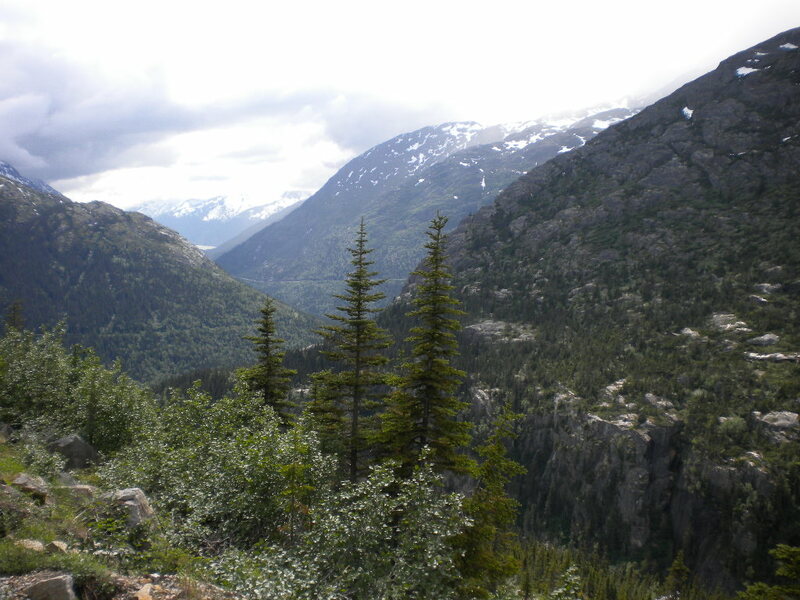 Did you know that Ketchikan gets an average of 162 inches of rainfall a year? That’s an average of 13.5 feet. Yes…It was raining. Climate is just one of the things that I think Alaskans just accept and deal with. The people we met seemed to be very satisfied with their pace of life and adapting to the challenges that Alaska offers. After helping my father find an eyeglass nosepiece repair kit… Note to tourist areas…Let some brand name pharmacy set up shop in your area, so that people don’t have to walk a mile and enter every little tourist shop and ask if they have [fill in the blank]. Now, I know they WANT you to go into every little shop. But if you are looking for something specific then it might be more beneficial to have an obvious drug store and people wouldn’t get frustrated… I set off exploring. I’m not a shopping kind of person, so I wanted to avoid the tourist trap souvenier places. I walked past the jewelry and tee-shirt shops…all of them bustling with activity… into the town. Up a hill and stone’s throw from the Episcopal Church, I discovered the Ketchikan Public Library and City Museum. I decided to visit. The library was closed. I’m not sure why, it was a Monday morning. But the museum was open. I like finding little known haunts like local bookstores, museums, and restaraunts . I contributed my donation to the city of Ketchikan, and stepped into the history of the town. The flow of the room went counter-clockwise, starting with various native artifacts of the Tlingit people, natives of the area. 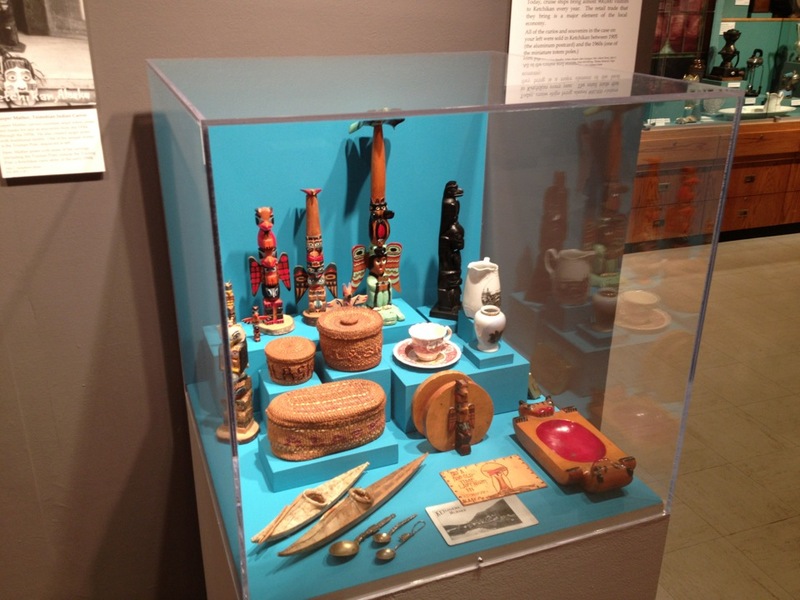 Small totems and various toys and tools carved from wood and whalebone. Native people are such experts at using available resources, and their attention to detail is amazing. There were also items from the early pioneer settlers of the area and mementos from the heyday of the salmon fishing industry. 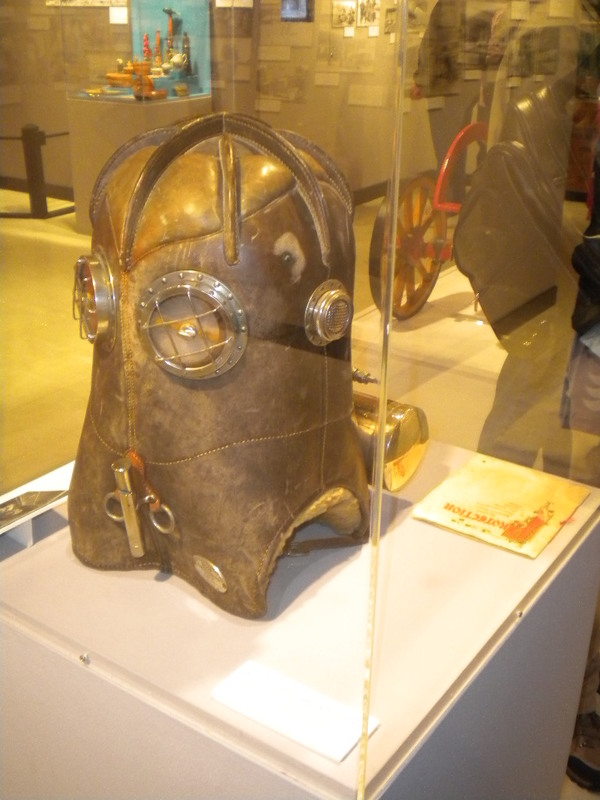 Like this awesome gas mask to protect workers from the ammonia that was used in cold storage facilities. I was fascinated by the pictures on the wall. 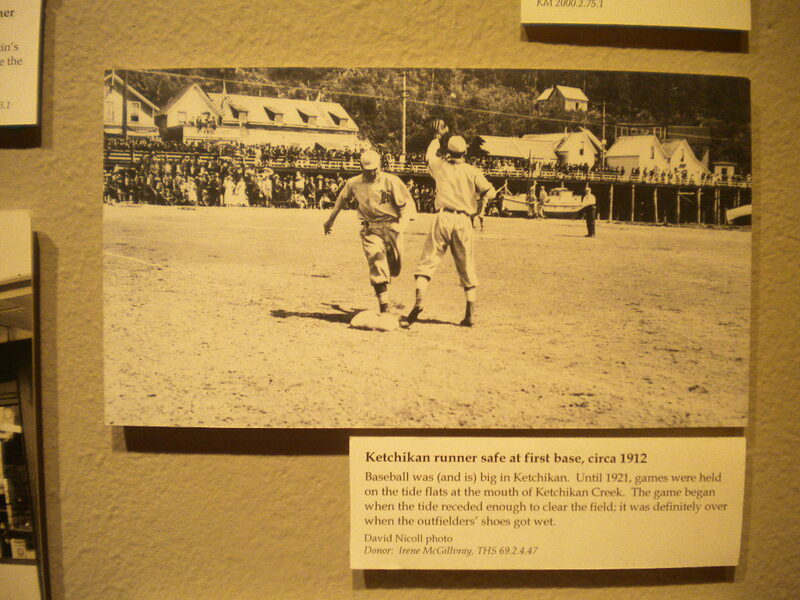 The photo shown here, conveyed a baseball game played in 1912. Because space was at a premium, they played games in the creek bed tide flats when the tide was out. The game would be called when the outfielders’ shoes got wet. This, to me, was descriptive of the spirit of the settlers in Ketchikan.